There’s one sure thing about tooth decay: you can’t ignore it. In fact, the best outcomes result from finding it early and treating it before it enters the pulp in the center of the tooth, often a filling or similar treatment. If it does advance to the pulp, you may need a root canal treatment to save the tooth. This is a moderately invasive procedure where we access the pulp and root canals, tiny passageways leading to the root and supporting bone. We then remove all the diseased tissue and fill the empty pulp chamber and root canals with a special filling. Later we’ll crown the tooth for added protection against future infection or fracture of the tooth. But there’s also another less-invasive method than a root canal called pulp capping. It’s only appropriate to use, however, if the pulp has become exposed or almost exposed by decay, but hasn’t yet shown signs of disease. Pulp capping can be either direct or indirect. We use direct pulp capping if the healthy pulp has been exposed by the disease process. We first isolate the tooth from the rest of the mouth to prevent contamination and then proceed to remove all of the tooth’s decayed dentin structure. We then apply a biocompatible material directly over the pulp to protect it from further decay and to facilitate healing. We then restore the tooth, usually with a filling, to its proper function and life-like appearance. When the pulp is threatened by decay but not yet exposed, we may then use the indirect method. In this approach we first remove most of the decayed dentin, but leave a small amount next to the pulp to keep it covered. We then treat this remaining dentin with a material to help it heal and re-mineralize, followed by a temporary filling of the tooth. A few months later we’ll remove this filling and inspect the treated dentin. If it has regenerated sufficiently, we remove any remaining decay and permanently restore the tooth. 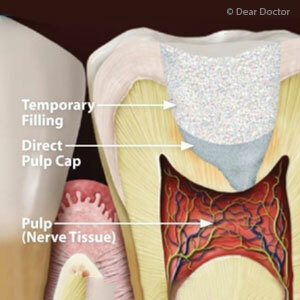 As we said, pulp capping is only used with patients with deep decay whose pulp tissue is healthy. But when we can use it we can avoid some of the permanent alterations that often come with a root canal treatment and still save the tooth. Why Do My Gums Feel So Sensitive? What Makes Professional Teeth Cleanings Different? Whiten Your Teeth Before School Starts Up Again! What is CEREC 3D Technology?